This is another recipe plucked right out my Nonna’s A cookbook. This salad was served in all of our family “special events”, so any birthday, baptism, party, Christmas, anything that involved a gathering of more than 20 people and this dish would make an appearance. Since I been reminiscing my younger years in the last couple of weeks, I of course made this. This dish, as my grandmother use to tell me could be found in any “antipasto” offering in Italy. During my travels, I have found countless versions of this salad but I always go back to my grandmother’s italian version. 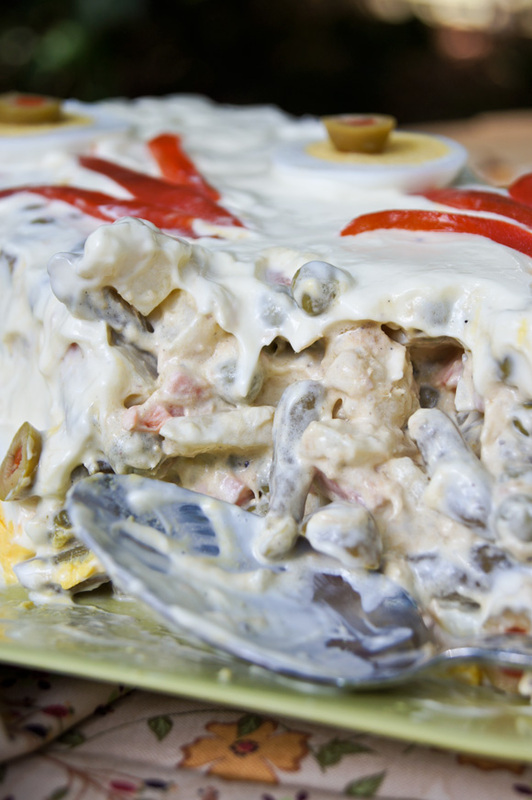 In Italy it’s mainly made with diced vegetables like potatoes, peas, carrots, green beans, and combined with homemade mayonnaise. There are many different variations that use less vegetables but the base is always made with potatoes, carrots and peas. Some add tuna fish, eggs or decorate the dish with capers or pickles. My nonna’s version has potatoes, carrots, peas, green beans, cauliflower and tuna. 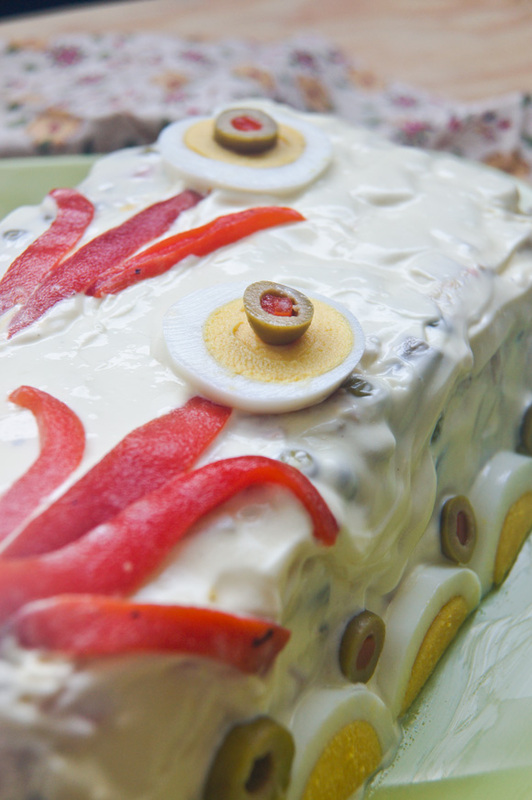 Then she would decorate it with hard-boiled eggs, roasted red peppers and olives. The secret to making a perfect salad is to keep the vegetables firm and almost crunchy, but cooked – think “al dente” in vegetable terms. My grandmother bought all of her vegetables fresh and then pealed them and cut them in uniform cubes, I have found that you can take a HUGE shortcut by buying all of the vegetables frozen, saving you from all that cutting and peeling. This leaves you only to deal with the potatoes. You may thinkg that you can apply this shortcut and use store bought mayonnaise, but I don’t recommend it, the flavor of the homemade mayo is what makes this dish special - plus making your own is quick and easy, I will show you how. Bring a pot of salted water with 2-3 tablespoon of vinegar and 1 tablespoon of salt (make sure you taste the water, it should be salted and tart) to a boil. Start adding the vegetables in the boiling water, place the potatoes first, and cook until “al dente” about 12 minutes, take out and place in a colander to drain. Continue with the, cauliflower, carrots, green beans and last, the peas. The tricks is for each vegetable to be cook thru, but not overdone - it needs to still have a bite to them – taste as you cooking them. Also remember that we are not shocking them in cold water, so when you take them out, they may continue to cook while they are cooking down. Let the cooked vegetables cool down, about 1-2 hours. TIP: make sure all ingredients are at room temperature; otherwise your ingredients may not emulsify property. You can make mayonnaise in your blender or food processor. But, I’m going to give you the best tip ever - I use my immersion blender and in less than 20 seconds it is made, plus is foolproof. Put all of the ingredients, in a tall narrow container (I use a mason jar with a big wide opening for my immersion blender to fit in). Place the handheld blender on the bottom of your container, making sure to cover the egg with it. Start mixing on medium to high speed (some use the pulse function, but I never do) until the bottom part starts to emulsify and you can spot yellowish streaks of mayonnaise slowly making their way to the top. Now – very slowly – start moving the immersion blender upwards until all of the oil is incorporated and you have a smoothly textured mayonnaise. That’s it. Now taste and adjust the flavors, by adding more salt lime/lemon juice and pepper. Some also add a bit of mustard, I usually don’t but again it’s up to your taste. Once your vegetables have cooled off, combined them in a large bowl, add the tuna fish and with a spatula mix, season with salt and pepper. In a separate small bowl mix the mustard, the olive oil and vinegars together, taste and add salt and pepper if needed, add it to the vegetable mixture and once more mix. Taste the vegetables; they should be well seasoned, just like a salad. Lastly add about half of the mayonnaise. Mix gently until well combined. Making sure the salad has a good consistency of mayonnaise, so if needed add more. Remember to leave some to cover your salad. My grandmother use to free form it in a platter, creating a rectangular circle and then covering it with the rest of the mayonnaise, then decorated it with the roasted peppers, hard boiled eggs and olives. You can also line a deep pan with plastic wrap leaving some wrap hanging over the sides. Spread the vegetable mixture with a spatula until even, cover the top with the plastic wrap and refrigerate for at least 2-3 hours or overnight. Open the plastic wrap and turn the salad over on a serving dish. Remove the plastic wrap and at this point cover with the leftover mayonnaise and decorate as mentioned before. Now find a excuse for a party so you can make this.